“Rest” Begins! | Run, Lindsay, Run! Thanks for the comments on my recap of the NYRR Mini 10K. Yes, I was majorly down on myself but actually helped hearing everyone had a pretty rough day out there. Thanks, 96% humidity! My ‘break’ from regular running luckily corresponds with (another) extremely busy week at work! My plan the next two weeks is to run 2-3 days a week for as long or as little as I want. I want to keep some fitness so I don’t start from scratch at the beginning of July, but 100% need a mental and physical break to begin fresh and amped up to train! On Monday, I was up bright and early at Grand Central Station at 7:15 am to catch a train to Stamford, CT to go to a client meeting. That night, I passed out at 9:30– I couldn’t even make it to the rose ceremony in the Bachelorette! 🙂 Definitely my body telling me I need more sleep. I was happy to finally have the chance to rest up, and not worry about squeezing in any miles. On Tuesday, I had to be at an event at 8:30 am, and by the time I got home around 7, I was feeling good and felt like heading out for a quick run. I did an extremely easy 2.25 miles around Riverside Park (the 5 pm office ice cream sundae social was a bad delicious choice-ugh!) and ended at the gym, where I did about 30 minutes of weights/core. It was just the perfect amount. This morning, I woke up and felt like running again! The weather was beautiful and cool but after a bit, my body was just not feeling it. I did about 4.25 miles total, but had to stop and stretch/catch my breath in the middle. I’m really not sure what’s wrong, but glad I am not worrying about mileage now. No plans to run the rest of the week, perhaps if the mood strikes me I will, but I think I need to listen to my body and rest up a bit more. And, take my liquid iron supplement a bit more regularly than I have been- whoops! I bought a lot of produce this weekend at Trader Joe’s, and needed to use it up before I’m at another event tomorrow (hooray for free catered lunches & dinners! ), and go home Friday night/Saturday afternoon. So, tonight’s dinner was fresh, fast and healthy so nothing spoiled. 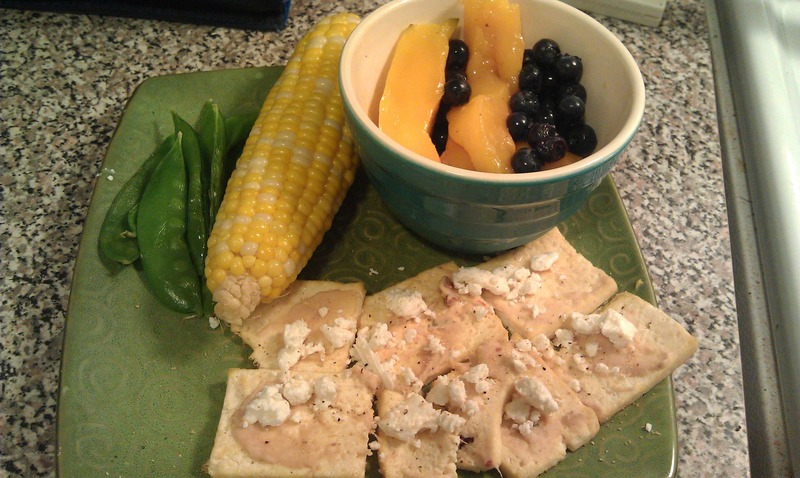 Baked tofu topped with TJ’s white bean hummus and feta; corn on the cob; snap peas; mango and blueberries! What do you have planned for this weekend? When you have a break from racing, do you typically rest completely, or do you still run or crosstrain regularly or lightly? I’m not competing or running consistently (I swim a lot now instead) but in the past during breaks, I made it a complete break. I think it’s as important for you mentally as it is physical – or at least it was for me. Breaks were a time to eat crap, stay up late, and imbibe. Granted, it’s different for us now that we’re in the “real world” but personally, I like to use the time to do whatever it is I couldn’t do (or did much less of) during the season. As for the weekend, I just got a free trial at a SICK gym in the mall near my house – it has a pool, endless cardio/weight equipment, and even a spa, juicebar, and hair salon – not that I go to the gym to get my hair done. I plan to take advantage of my free trial and then find myself a free pass for a different gym for the week after. I’m thinking of just getting as many free trials as possible and wait to invest in a membership until I’ve exhausted all the local free trials. What gym do you go to? Sounds like a good plan. I myself am a little anxious about not running that much since my last marathon and when I start training for NYC, but I try to remind myself that 18 weeks is a LONG time! Any time I try to run “faster,” it feels so hard, still. Ugh. I think a break is def in order for you! Esp after having some good races this spring. And, keep in mind, its starting to get hotter and I always think that heat adjustment at the beginning of the summer makes anything seem a little bit harder (eg: When I played tennis I remember 90 felt so hot in June and by August that felt cool!). Lord, I’d love to be fast enough to run with CPTC. I think I’d get a lot better. But, maybe one day! If you ever need a slow person to run with, you now who to call! I am sure CPTC will help you become stronger in the long run and having the fun and camaraderie is great too. I am sure November 6th will be an AWESOME day for you! One thing I was interested in is what has been your experience with iron supplements. I was diagnosed as anemic a month ago and have been taking supplements. I think they are helping…but just curious about another runners experience. Lindsey! I didn’t get to comment after the Mini, but you know what? everyone has bad races and although having them is never fun, you just have to get it out of your system. PRs are around the corner and I know it! The workouts and hard work will pay off in the end! After your rest you are going to come back fresh and rejuvenated! I know you are taking it easy, but if you care to run anytime next week, holler at me! I think there’s definitely an adjustment period when it comes to training and racing with CPTC – I found that the Thursday night tempos really took a lot out of me because of the pace + mileage. Everyone needs to take a break and it sounds like your approaching yours very wisely. Running “by feel” for a few weeks can be very refreshing! You are so good at listening to your body and taking needed breaks – I’m sure it’ll pay off in the long run. If I take a break, I usually like to cross train or do some yoga to keep myself from going nuts. Glad to hear you’re in better spirits about the race!! When I take breaks from running, usually it involved other forms of activity (cross training, yoga, strength training) but I try to really listen to my body to find what the right amount is. A “rest period” won’t be very effective if I push too much and don’t really let myself rest. I try to pay close attention to how I feel during workouts and go from there. Sounds like this is a good decision for you, and I hope you have a great weekend!